3DCEA – Dept. of Environmental Sciences and Engineering. Faculty of Sciences & Technology - NOVA University of Lisbon. The montado is a unique multiuse system, with a high ecological, and socio-economic value. Several types of stakeholders act directly on this system at the farm level, working on the numerous sectors of activity characteristic of this landscape, while others have influence on the regional level by working at a more institutional level. 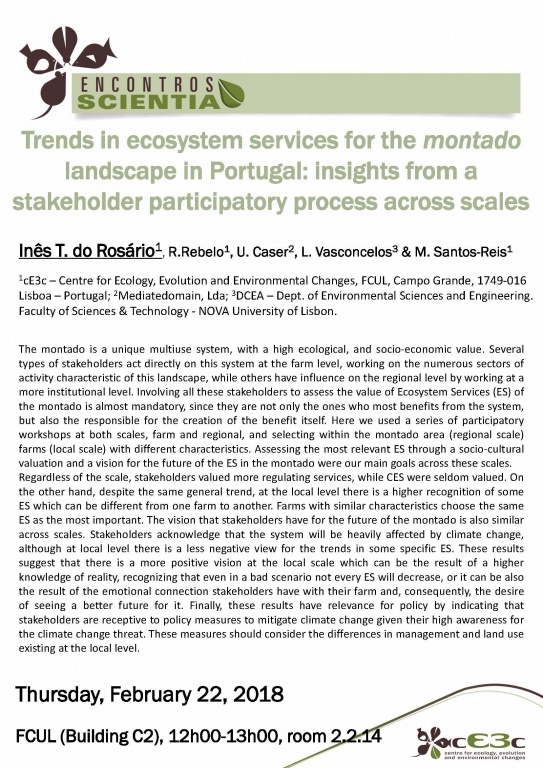 Involving all these stakeholders to assess the value of Ecosystem Services (ES) of the montado is almost mandatory, since they are not only the ones who most benefits from the system, but also the responsible for the creation of the benefit itself. Here we used a series of participatory workshops at both scales, farm and regional, and selecting within the montado area (regional scale) farms (local scale) with different characteristics. Assessing the most relevant ES through a socio-cultural valuation and a vision for the future of the ES in the montado were our main goals across these scales. Regardless of the scale, stakeholders valued more regulating services, while CES were seldom valued. On the other hand, despite the same general trend, at the local level there is a higher recognition of some ES which can be different from one farm to another. Farms with similar characteristics choose the same ES as the most important. The vision that stakeholders have for the future of the montado is also similar across scales. Stakeholders acknowledge that the system will be heavily affected by climate change, although at local level there is a less negative view for the trends in some specific ES. These results suggest that there is a more positive vision at the local scale which can be the result of a higher knowledge of reality, recognizing that even in a bad scenario not every ES will decrease, or it can be also the result of the emotional connection stakeholders have with their farm and, consequently, the desire of seeing a better future for it. Finally, these results have relevance for policy by indicating that stakeholders are receptive to policy measures to mitigate climate change given their high awareness for the climate change threat. These measures should consider the differences in management and land use existing at the local level.